This is our new take on one of nature’s definitive designs. The Barkley tray resemble giant sliced tree trunks and plays with their natural colors and patterns. This collection also includes a Center Table and a Side Table. An antique is a collectible and desirable since it is an object that represents a previous era in human society. The Floreal vases are covered in our floral embossed bonded leather, finished to look like antique gold. They are a perfect accent to a traditional setting but will also complement modern spaces because of its simplistic shape. Often called the tree of life, the coconut tree is unique in its versatility. It is abundant and plays a big role not only in tropical countries, but also throughout the world. Emphasizing it's lightness, Ringo was shaped and assembled by hand to form these organic shapes. Available in young light coco shell or dark brown coco shell versions as vases, bowls, hanging lamps and tea light. This collection started out as a need to utilize excess bonded leather materials and create a new look. The cut-out leather trimming are arranged in a pattern suggesting a magnified weaving. Masquerading as splintered wood. This bowl collection in two sizes, adds interest and a natural vibe to any room. Hand-laminated over molded resin in our unique material-Turnsole, it can be finished in Black Oak, Birch or Walnut. Mimicking the concept of the big bang theory, Eggsplosion bowls or platters come in a yin & yang design that is an eye catcher in any setting. This clustered and loose pattern of natural hand-inlaid eggshell is indeed innovative. Aside from the Star Gold finish shown, any custom color is possible. This collection takes on a modern approach to the traditional concept of iconic windows of Spanish ancestral homes in our country. Used as light diffusers, the capiz shells are individually fitted by hand into a wood frame laser-cut in a geometric pattern. Available as Wall Art and Tea Lights. The Mestisa is an innovative idea that represents the natural charm of capiz and a historic period in the Philippines. Taking inspiration from the carving skills of a local community, the designer marries the natural beauty of carved wood and modern shapes. 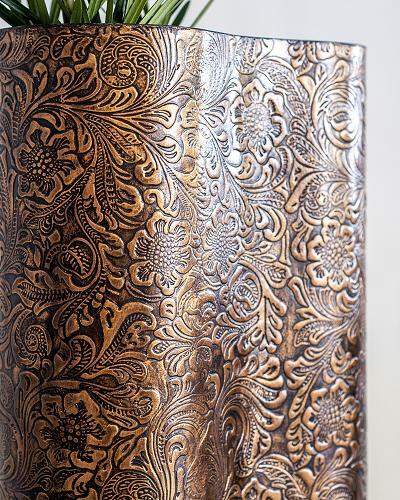 The intricate wood carvings are finished in natural lacquer showing the wood's grain patterns. This wall art is trimmed with white gloss-lacquered borders. The Rosa is a transitional collection that embodies minimalist design and the warmth of ornamental décor. This is your great solution to an empty wall, may it be a backdrop for a dining room or a powerful statement as you enter a lobby. It is a compilation of our signature materials arranged carefully to create a harmony of textures and colors. The ribs of the fan are in Old Copper-finished steel bars. This unique wall art gained admiring glances for it's undulating shape. Plenty of intrigue was provided by the assortment of indigenous laminated materials in their rich natural finishes. Available as individually sold or a set of 3. Just like the city it was named after, the Havana mirror has a classic feel of Spanish and American Style.The Natural Tobacco Leaf Lamination is rich in detail. Each leaf unique with its own vein patterns and brown colors. Paired with the Old Gold Finished Frame, this mirror is a great way to complete your Vintage Home.